The point of this, in terms of technological progress, is that we’ve gotten so accustomed to Moore’s Law that we sometimes overlook the implication that the deeper we get into the chessboard, the bigger the changes. We all know that computers advanced a lot between 1991 and 2011, but we should expect the scale of change over the next 20 years to dwarf those changes. This is a straightforward application of a well-known principle and some pretty basic math, but it’s usually not discussed in quite the right way. We think we’re used to the idea of rapid improvements in information technology, but we’re actually standing on the precipice of changes that are much larger in scale than what we’ve seen thus far. In 1950, true AI would look like a joke. A computer with a trillionth the processing power of the human brain is just a pile of vacuum tubes. In 1970, even though computers are 1000x faster, it’s still a joke. In 1990 it’s still a joke. In 2010 it’s still a joke. In 2024, it’s still a joke. A tenth of a human brain is about the processing power of a housecat. It’s interesting, but no threat to actual humans. So: joke, joke, joke, joke, joke. Then, suddenly, in the space of six years, we have computers with the processing power of a human brain. Kaboom. Here’s the point: technological progress has been exactly the same for the entire 80-year period. But in the early years, although the relative progress was high, the absolute progress was minute. Moving from a billionth to a trillionth is invisible on a human scale. So computers progressed from ballistics to accounting to word processing to speech recognition, and sure, it was all impressive, but at no point did it seem like we were actually making any serious progress toward true AI. And yet, we were. 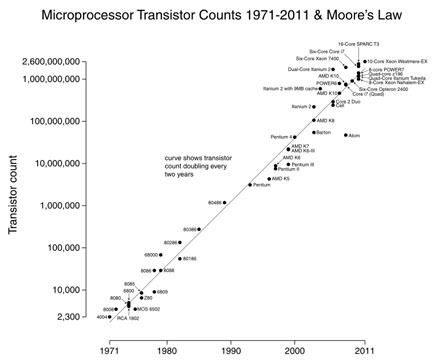 Assuming that Moore’s Law doesn’t break down, this is how AI is going to happen. At some point, we’re going to go from 10% of a human brain to 100% of a human brain, and it’s going to seem like it came from nowhere. But it didn’t. It will have taken 80 years, but only the final few years will really be visible. As inventions go, video games and iPhones may not seem as important as radios and air conditioners, but don’t be fooled. As milestones, they’re more important. Never make the mistake of thinking that just because the growing intelligence of computers has been largely invisible up to now that it hasn’t happened. It has. Who Will Tend the Machines That Tend the Machines?